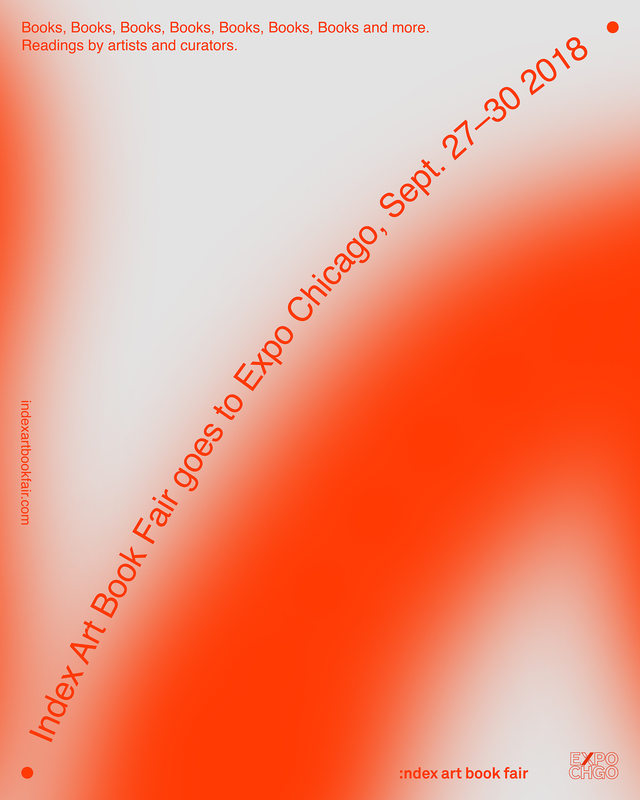 Dear friends, we are very happy to announce the participation of Index Art Book Fair at Expo Chicago (International Exposition of Contemporary & Modern Art), July 27–30 2018. The Black Flame of Paradise is the first novel by American artist Zachary Cahill. The book is a proposition for a new model of religious life grounded in the artistic and personal relations to the divine. The signing will be followed by a reading. Published by Mousse. 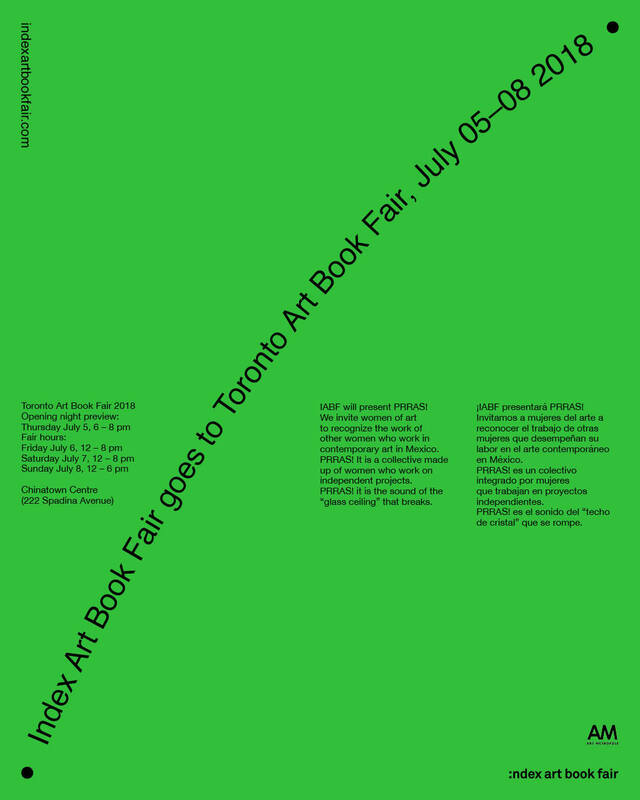 Dear friends, we are very happy to announce the participation of Index Art Book Fair at the Toronto Art Book Fair, Toronto, Canada, July 05–08 2018. Dear friends, we are very happy to announce the participation of Index Art Book Fair at "An Art Book Affair" a show curated by Jo-ey Tang and presented at the Beeler Gallery at Columbus College of Art and Design, Columbus, Ohio. 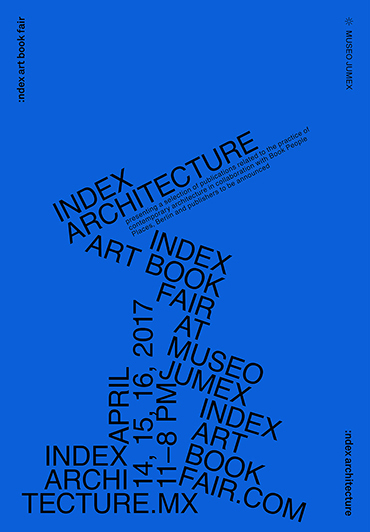 Dear friends, we are very happy to announce the third edition of Index Art Book Fair that will take place from the 14th to the 16th of April at Museo Jumex, Mexico. In collaboration with the Jumex Foundation and as part of the public program of the exhibition 'Dear Reader. 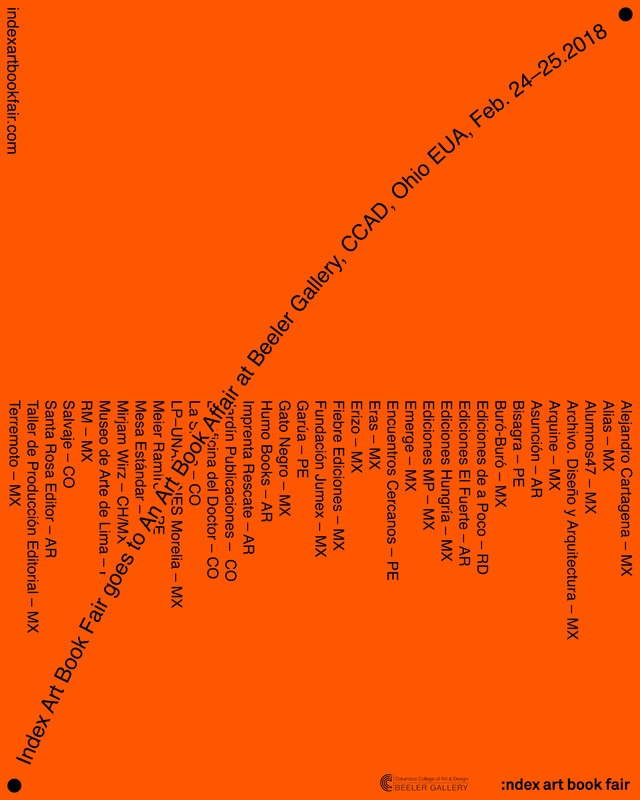 Don't read' by Ulises Carrión, Index Art Book Fair and Jumex Foundation present 'Spoken Word Gallery' by Tania Pérez Córdoba and Francesco Pedraglio, an ephemeral exhibition developed in the museum's facilities using spoken language as the main medium. This project will be presented on Friday, April 14 at 1 pm. Also on Saturday 15 at 4 pm in the lobby of the museum Raul Marroquín and Juan A. Aguis, both contemporaries of Carrión, will be talking about his work and the canon of artist's books in Mexico. Spoken Word Gallery es un proyecto de Juan de la Cosa / John of the Thing. Sin imágenes ni objetos físicos, Spoken Word Gallery presenta un programa de exhibiciones creado únicamente a través del lenguaje hablado. 2 Cada punto formando un nuevo presente. 3 El mundo se reorganizará alrededor de cada nuevo presente. 10 Y de pronto un destello repentino de luces negras mientras la cabeza voltea y retrocede y un cerebro impacta contra la parte trasera de un craneo. Dos invitados, personal y profesionalmente cercanos a la vida y obra de Ulises Carrión, compartirán con el público impresiones sobre el legado de este artista, su influencia y actualidad. Vive y trabaja en Ginebra, Suiza. Ha sido estudiante de arte en París, galerista y editor de libros de artista en Ámsterdam y librero especializado en las últimas vanguardias en Ginebra. Actualmente se encarga de la conservación y publicación de los documentos personales de Ulises Carrión, siendo el propietario legal de sus derechos de autor. Artista multimedia que trabaja con video desde 1968. Es considerado uno de los pioneros de videoarte en Europa. Su obra forma parte de un gran número de colecciones públicas y privadas, como Stedelijk Museum Amsterdam; Centre Pompidou, París; Museo Nacional Centro de Arte Reina Sofía, Madrid; Moderna Museet, Estocolmo; Museum of Modern Art, Nueva York; Colección Saatchi Londres; Ludwig Collection, Alemania; Bonnefanten Museum Maastricht, Alemania. Su trabajo ha sido presentado en museos de Europa, América y Asia; así como en diversas instituciones como ICA, Londres; ICC, Amberes; Neue Galerie, Aquisgrán/Colonia y Chicago Art Institute. Artista, escritor y académico inglés. Entre sus exposiciones individuales están New Painting, Drop City, Newcastle (2015),; The Cat, Carpeted, Le Salon, Bruselas (2012); Noble Prince Of The Royal Mysteries, Vane Gallery, Newcastle (2008); Fontanelle, Transition Gallery, Londres (2005) y Chapter Gallery, Cardiff (2003). También ha mostrado su trabajo colectivamente en exposiciones como The Decorator & the Thief, Northern Gallery of Contemporary Art, Sunderland (2015); The Imaginary Archive, Whitechapel Gallery, Londres (2015); When I Was Young I Never Needed Anyone, MAUVE, Viena (2014); Auto Italia Live, ICA, Londres (2013); Sincerely how am I talking?, Hollybush Gardens, Londres (2012). Becker es coeditor del libro Cadavere Quotidiano (X-TRA Publishing, Los Ángeles, 2014) y cofundador del espacio de Drop City en Newcastle. Poeta, ensayista y editor radicado en la Ciudad de México. Algunas de sus publicaciones incluyen Leyendo agujeros. 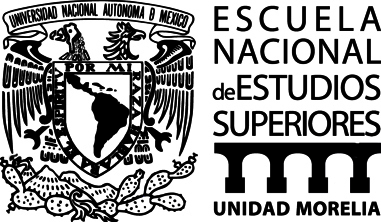 Ensayos sobre (des)escritura, antiescritura y no escritura (2005), Cabaret Provenza (2007), La sodomía en la Nueva España (2010) y Poemas de terror y de misterio (2013). Su trabajo como editor incluye Divino Tesoro. Muestra de nueva poesía mexicana (2008), La Edad de Oro, Antología de poesía mexicana actual (2012) y Arte & basura. Una antología poética de Mario Santiago Papasquiaro (2012). 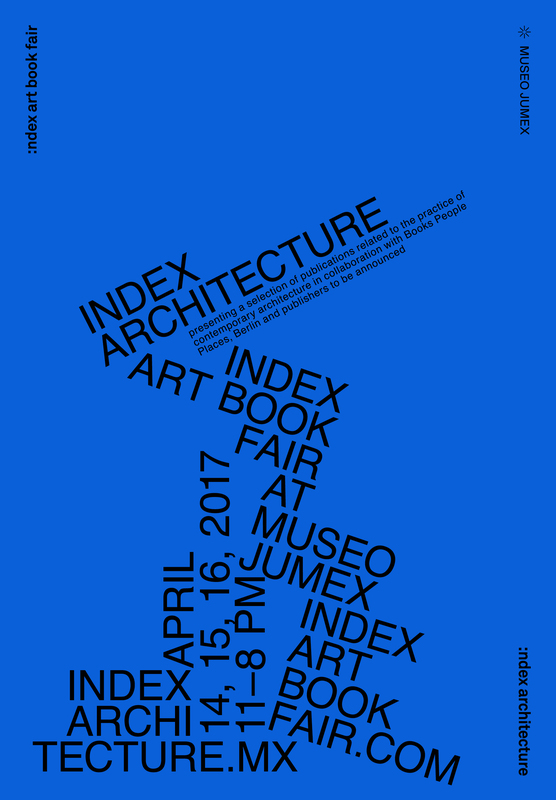 Index Architecture will be presenting a selection of publications related to the practice of contemporary architecture in collaboration with Book People Places, Berlin and publishers to be announced. 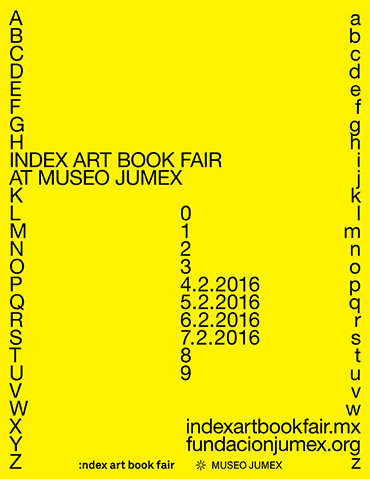 Dear friends, we inform you that Index Art Book Fair website has changed. You can now log on to indexartbookfair.com to find all the information and dates about the fair. Accattone is a new and independent magazine on architecture started in 2014. Based in Brussels and self-published by two architects and two graphic designers, Accattone explores ‘minor’ practices in architecture through the specific means of the printed magazine. Accattone addresses critically a fundamental aspect of architectural thinking and practice: the working document and the changing status of the image in the design process. Accattone’s interest lays in a hybrid cross-fertilisation of disciplines and approaches, that work very well within the format of a magazine and make sense while aleatory leafing the pages, emphasized by an editing that subtly diffuses the distinctions of the diverse contributions. 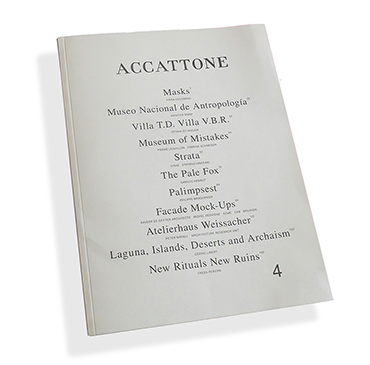 The latest issue of Accattone #4 draws on the idea of the collection to explore mythical methods and visual ethnographies in contemporary practices, with an interest in the compression, into a single artifact, of long periods of history, power relations, memories, and everyday experience. It features anthropology museums, underground data centers and minor collections performed in private houses, double-sided masks, and architectural strata in a floor slab or a facade, totemic mock-ups on a 1:1 scale and metaphors in the desert. With contributions by Frida Escobedo, photos by Kristien Daem and Philippe Braquenier, a return on an installation by Ištvan Išt Huzjan with Sam Steverlynck, Frank Tuytschaever and Jurgen Vergotte, a visit to Pierre Leguillon’s Museum of Mistakes and ARU’s visit to an house by Peter Märkli, an interview with 51N4E, photos of Camille Henrot’s installation The Pale Fox, essays by Cédric Libert and Freek Persyn, models and mock-ups by Bruther, XDGA, CAB, Barthélémy-Griño, Michel Desvigne. 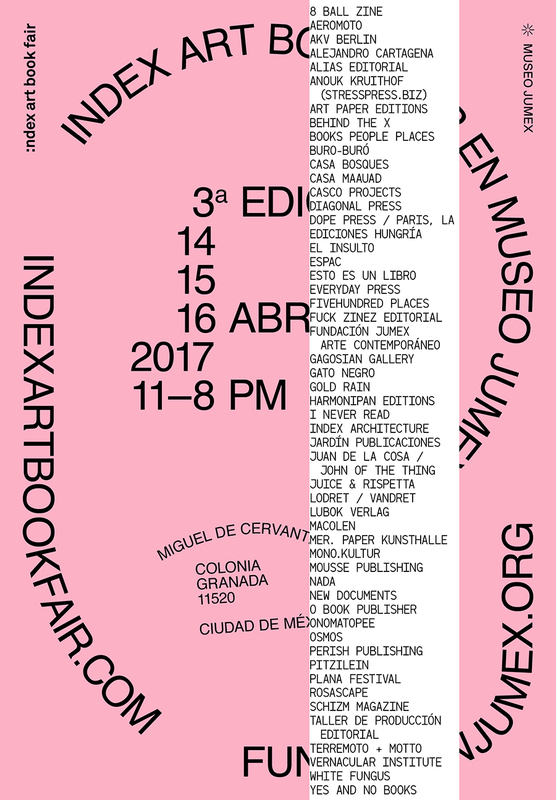 “¡Gracias a Index Art Book Fair y Casa Bosques por hacer esta utopía posible! Gracias a ellos, ahora en Aeromoto puedes consultar los libros que Art Catalogues, LACMA Los Angeles County Museum of Art, 1301PE, Publication Studio Hudson, New Documents, Fillip, Other Forms, Columbia GSAPP, Sternberg Press, Banner Repeater, Corraini Edizioni, Tiny Splendor, White Fungus, Night Diver Press, Osmos Magazine, Publish and be Damned, LAXART, Sophie Dars (accattone.be), MER. Paper Kunsthalle, Gagarin Magazine y Schizm Magazine amablemente donaron. 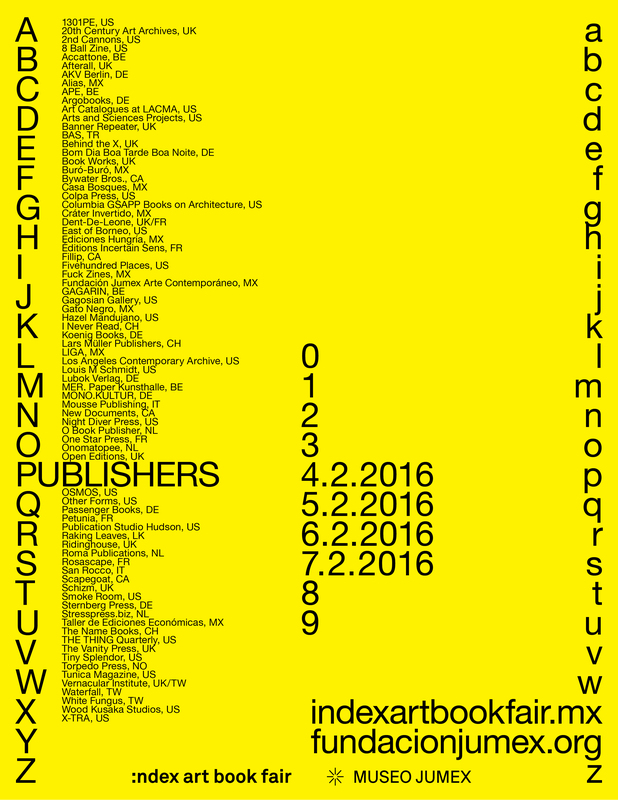 Join us from September 17th, at the 10th annual NY Art Book Fair at MoMA PS1. We are with our friends Fundación Alumnos47 in booth N26, come to say hi. Tania Garduño curated the selection of books and is presenting the publication "between p10" (Artists' Books from Mexico) in colaboration with Fundación Alumnos47. 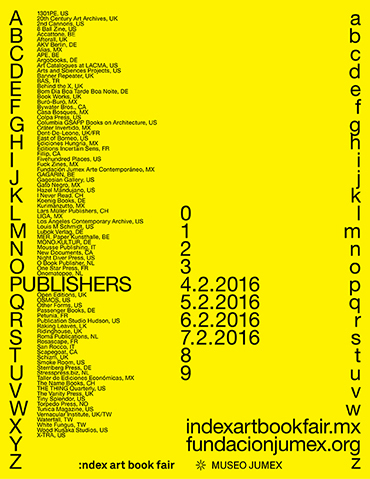 Index, the first art book fair in Mexico focused on independent publishers. 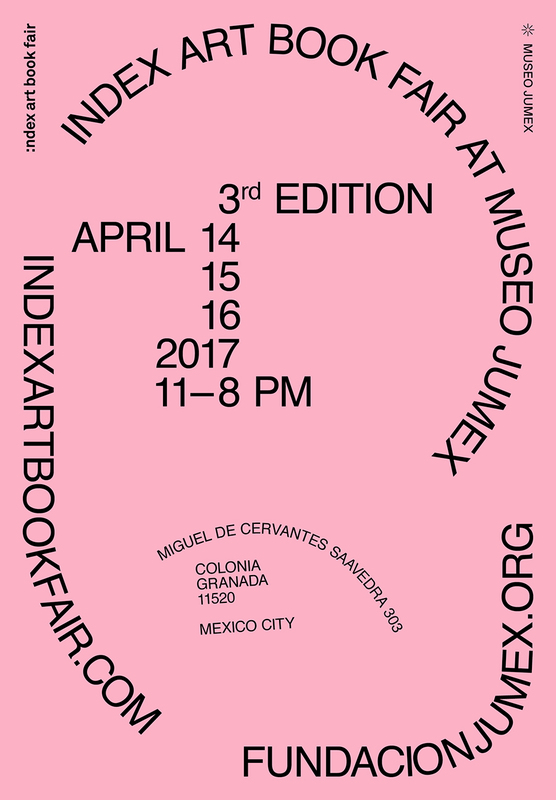 Encompassing Mexican, South American and European art publishers through collaborations with celebrated and established fairs, Index aims to bring to wider attention editorial projects centered around contemporary art that lack big distribution as well as open a space for dialogue and exchange within the context of Mexico. Index assembles an exciting program of events that include exhibitions, conferences, workshops, and more, providing a unique opportunity for editors and the wider public alike to discover, enjoy and discuss the cutting edge of art publishing today. If you wish to stay up to date with our forthcoming events, publications and activities you can subscribe below and get our newsletter. IABF is Jorge de la Garza, Maxime Dossin, Chantal Garduño, Tania Garduño and Rafael Prieto.